Cassandra Bowden is a highly functioning alcoholic. She is a veteran flight attendant, and works international routes. She drinks to the point of blacking out, which I now understand is different from passing out. One morning in Dubai, she awakens next to a dead man, with spotty memories of what happened the night before. While I read the book and finished it just to see what would happen, I never really felt all that invested in the story. Cassie’s entire life centers around drinking to excess and one-night stands. Same thing, day after day, from one country to the next. She rationalizes her drinking and, even after waking up next to a corpse, all she thinks about is drinking and picking up men. I’m thinking that would have changed my perspective a bit, so I found it hard to relate to her. The book seemed to plod along, and at the end it picked up the pace and there were a few twists I didn’t see coming, but it felt rushed. I liked the writing style, but the characters and the storyline were disappointing. Cassandra Bowden's life is a wreck; she's an alcoholic with little self-control who sleeps with different men, both at home and on overnights while working as a flight attendant. While on a flight to Dubai, she befriends a male passenger and has a rendezvous with him that night; when she awakens she finds him dead in bed beside her. This event sends her life into a tailspin, eventually leading to a surprising conclusion. 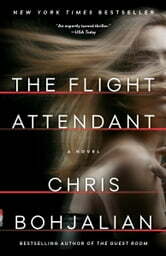 "The Flight Attendant" is an absorbing read from beginning to end, but I found none of the characters particularly likeable. I was struck too by the many stupid mistakes Cassandra made - both before and after the Dubai incident. While I enjoyed the book, I did not find the ending particularly satisfying. I would have given it four stars were it not for the ending. I finished the book mainly because I paid for it. All in all, the synopsis sounded interesting but the book did not live up to my expectations. Cassie,bathe main character is a sorry excuse for a human being who drinks too much and lie about everything on top of being a petty thief. Anyway, the 3 stars are mainly because the author spent time researching his facts. Imagine waking up in a bed that's full of blood - and a murder victim. That's what happens to flight attendant Cassandra Bowden. She's almost sure she didn't commit the murder - and couldn't be capable of it. Then again, she's a black-out drunk so it's hard to convince herself 100%. I've seen reviews that say this isn't Bohjalian's best work - if that's the case, I very much look forward to reading more from him - I read The Sleepwalker and now this one, and very much enjoyed both. Good pacing, interesting characters, surprises - an excellent read overall. Thanks to Netgalley and Doubleday for providing a copy for an unbiased review.